Three things of note happened today. At least these are the three that I can remember. 1. The van came back home. 2. Kade lost his second tooth. 3. 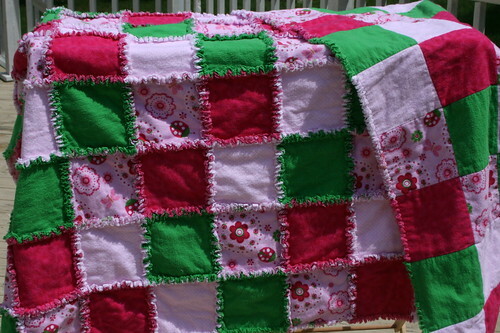 I got to deliver a super soft rag quilt to a new baby. I love how it turned out. The baby's room is done in pink and green with lady bugs on the wall. I was so excited to find that lady bug print. Awww, that makes me think of our beautiful purple/green one. You are a master at that.